Mitch Robbins finds himself going through mid-life crisis along with his best friends, Phil and Ed. Mitch is dissatisfied with his current job at the radio station and to make matters worse, he embarrasses his son during career day at school. Mitch’s wife, Barbara, throws a birthday for him and Mitch’s friends show up with their wives. Mitch is excited to learn that his friends are giving him a two-week cattle drive vacation for his present. His wife is less than enthused about the trip but eventually agrees to let him go after she realizes that Mitch is despondent. During the cattle drive, Mitch, Phil, and Ed use the time to talk about their own lives and relationships. One morning Mitch accidentally spooks the cattle and sends them into a stampede. With some cattle still missing, the trail boss, Curly, asks Mitch to come with him to recover the missing cattle. Mitch and Curly eventually recover the extra cattle, but have to spend the night out in the wilderness. Curly and Mitch get to know each other and Mitch confides his problems to Curly. Curly tells Mitch he can figure out the secret of life, that it is ‘one thing’ that he has to find on his own. On the last day of the cattle drive, the three friends discuss what they should do about their lives. Phil wants to start over after his divorce is final. Ed decides to have children with his girlfriend. Mitch finally figures out what the secret of life is, and he realizes that it means something different for everyone. Mitch is happy to return home to his family and brings a newborn calf with him. His family and the calf are loaded up into the van and they head home. 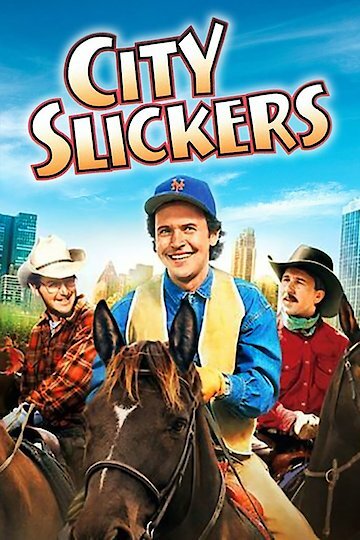 City Slickers is currently available to watch and stream, buy on demand at Amazon, Vudu, Google Play, FandangoNow, iTunes, YouTube VOD online.